Softwood decks are made from Softwood trees which are usually Treated, Pine. It is a cost effective option and therefore most popular for decks. Decks come in different types from simple to the more elaborate variety. 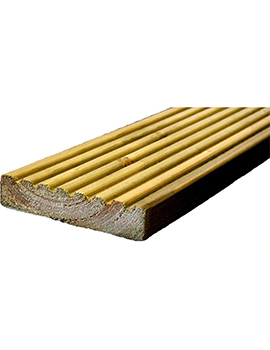 The main difference between Softwood and Hardwood decking is the cost. Softwood decking is made from homegrown trees or is imported. Slow grown timber seems to give decking of a superior grade than local. These come in options of 150mm wide and 35mm thick and are reversible with usually one ribbed and other side being smooth. Pressure treated for long life. Build world's Reversible Softwood Decking boards are just perfect for deckings and renovations to outdoor spaces. 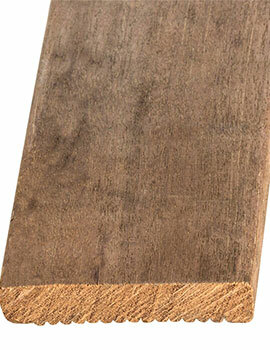 Classic deck board profiles and pre-treatment ensure long life and a knot free, consistent finish. A house is not a singular structure with the very same elements throughout. Buildings reflect the personality of the owners and each part of the place can have unique properties that match the purpose it is intended for. Visuals are also another important aspect that will differ from owner to owner. Buildworld understands that each building is dynamic and requires choice to attain its own character. That is why we have an unmatched range of building materials from established makers, giving you the best choice and that too, at some fabulous deals. Leisure time immediately brings to mind Decks that offer a space to soak in the sun and breeze. Decks are usually floored with timber for a holiday feel and to match a pool or beach area. A modern alternative to timber are available today, such as Vinyl boards and systems (UPVC) or composite deck boards, but wood remains by far the most popular. Moreover, composite deck boards require expert fitting, while timber can be easily fitted with a DIY job. Once you’ve decided on a timber deck, the choice required is Hardwood or Softwood? First of all, hardwood and softwood are in no way soft or hard. Both are wood and can last up to 40 years if treated correctly. Hardwood and softwood just are timber from different species of trees and have different properties. If not maintained well, both will take on a dull grey colour after some years and even look the same. Hardwood comes from trees such as Teak, Ipe, Yellow Balau and at rare times Massaranduba. These trees generally come from slow-growing rain forests, which are properly farmed due to environmental concerns. This kind of wood requires a higher expertise for fitting and different kinds of tools than softwood. Hardwood also needs additional work like screw-setting and pre-drilling, which is not needed in softwood. Softwood comes from fast growing coniferous trees, generally from European farms. These are divided in to ‘redwood’ and ‘whitewood’ as per their colour. Trees for softwood are Pine, Spruce, Fir, Thuja and Cedar. Red Cedar, in particular, is an expensive softwood, as the wood releases a natural oil that combats decay. When it comes to choosing between the two, important issues to consider are the area, maintenance and durability. If you are looking for a tough deck, in an open area that may be prone to weather, then a hardwood is best, but it will cast as far as maintenance goes. Softwood is better for an indoor area that will face rough weather and will also cost less.